Carbon exists in more than one allotropic forms, and the allotropes have different physical properties due to different arrangement of atoms. I am going to compare their hardness for now. From what I read, graphene is hard but graphite is brittle. If graphite is made up of many layers of graphene, then why not graphite is stronger than graphene? I suppose when you say graphene (or diamond) is hard, it means that, for example, when you take a hammer to strike the layer of graphene, the layer is not easily broken, that is, the covalent bonds are hard to be broken by physical means. Does this mean that we can only cut the graphite in one dimension? I thought the graphite being brittle already implies that graphite can be cut in more than one dimension? Hardness and brittleness are not contradictory properties. There are plenty of substances that are both hard and brittle (cast iron is a good example, glass is another). And "strength" is different as well. It depends on context. Tensile strength is not necessarily related to ability to survive a blow: some compounds with high tensile strength (which basically means the compounds resist being stretched) are incredibly fragile (or brittle if you prefer that term). Some compounds with low tensile strength are very hard to break (nylon rope, for example). Part of the problem is that many of the properties of materials are based on the structural properties of the bulk material not the idealised properties of the chemical bonds making up the material. Some metals, for example, are tough (not brittle) and are hard to break but this property arises because defects in the crystal structure can move around absorbing external stress. Brittleness is often caused because no such mechanism exists and, once a surface bond breaks, the stress on the next bond gets worse, releasing energy and propagating a crack, tearing the material apart. Glass often has many small surface cracks which, under tension, concentrate stress making them brittle and subject to falling apart. But very pure, carefully grown glass fibres can be nearly crack-free making them much stronger under the same stress. In short to explain brittleness, toughness or strength, you need to know the macroscopic makeup of the bulk material not just the chemical composition. So it is with graphite. There is no easy mechanism in a single graphite crystal to dissipate stress if a bond breaks, so it will tend to be brittle. But most samples of graphite are not single crystals: in most cases they will consist of a bunch of small units with the layers oriented in different directions. So bulk graphite isn't just brittle but also soft as some orientations will slide easily around. And it is hard to even talk about bulk graphene because by definition it is a single layer or a very thin bundle of layers. When people say graphene is strong they usually mean that it has high tensile strength along the plane of the layers. This doesn't mean it isn't either brittle or hard and even if it were in some orientations, it probably would not be in others. The planes of graphite are easily shifted against each other. That means if you try to bend it, the individual planes cannot support each other and distribute the load. In a solid 3D structure like diamond or wood, the outer layers would just feel a linearly increasing extensional force, and the inner layers an increasing compression. Not so in graphite, the few innermost layers at the bend get all the load, and snap. And then the next few, and so on. Graphite, despite being rather soft, is brittle. The layers in graphite are not perfectly aligned. They are aligned in many different directions, meaning that they can slide across each other if you apply a force in any direction. 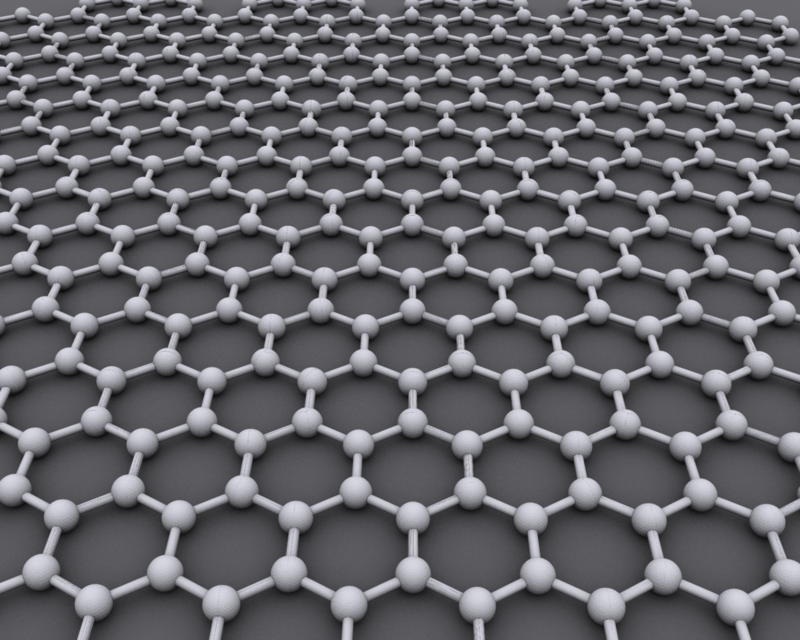 But for graphene, obviously the atoms are perfectly aligned on the hexagonal network, so it is much stronger. Not the answer you're looking for? Browse other questions tagged inorganic-chemistry carbon-allotropes or ask your own question. How are turbostratic graphite phases formed? 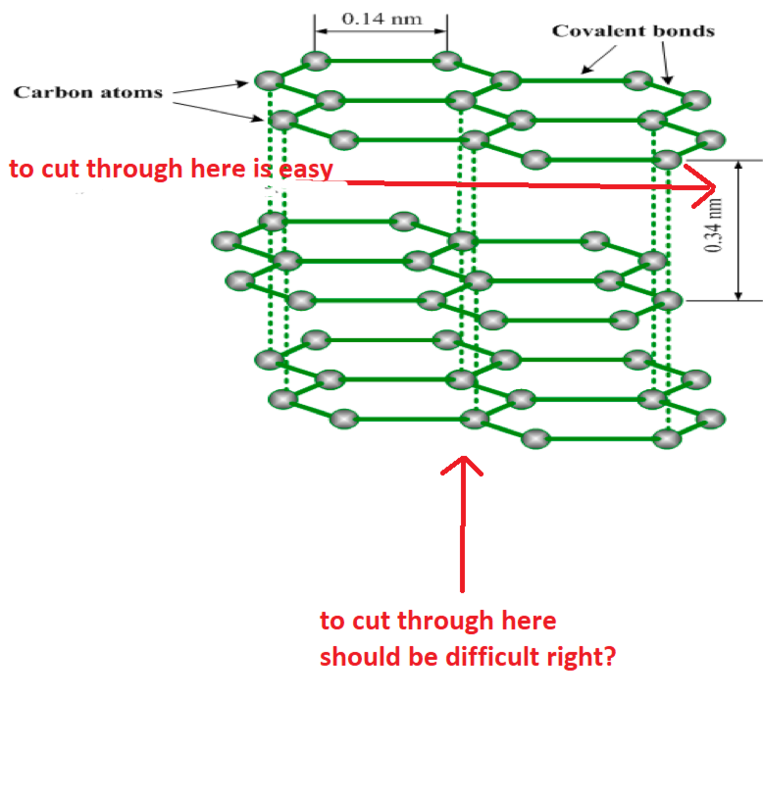 Why is fabrication of ordered graphite substrates difficult?